There's nothing boring about a Rottweiler, so you won't find a boring encyclopedia here! Instead you'll learn everything you want to know about the Rottie, how to have a fabulous relationship with your dog, and you'll have fun doing it. Hi! 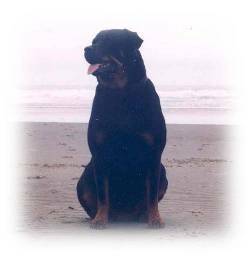 My name is Jennifer, my husband and I have been owned by two very different Rott's over the last 16 years. They have been anything but boring! We raised our first, Savannah from the time she was 9 weeks old. Our second, Chevy, is a Rescue, and he adopted us when he was about 15 months old. I'm here to help you get to know the real Rottie, especially if you're a new owner. And make sure you have a fantastic relationship with your dog - Just like I do. Are you a brand new owner? 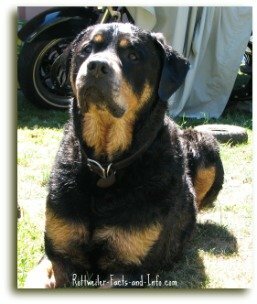 If you're a new owner, contemplating getting a puppy, or maybe even rescuing, then this is a great place to learn about the REAL Rottie. And what you can expect for the next (hopefully) 12 to 15 years. 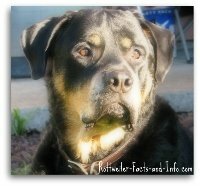 Are you the proud owner of a Rottweiler Mix? You're probably aware that Rottweilers have had their fair share of bad press. I can't stress enough that they are NOT the dog for everyone. They are big, strong, smart (sometimes referred to as bull-headed)and very protective of family and property. These are the reasons why Training is so important! 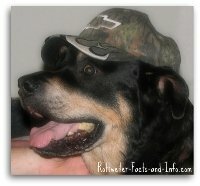 As a Rottweiler owner, you have to go above and beyond to better the reputation of the breed, and to protect yourself and your dog. That may not be "right", but it is the way it is and anyone considering this breed of dog needs to be aware. Most dog's are very annoying if they're not trained properly, but an un-trained Rottie can be downright dangerous and a liability - Not to mention make your friends afraid to come over. Actually, you'll find (or you've already experienced it) that people are afraid of your dog simply because of the way she looks, or for the simple fact of what breed she is, regardless of how well trained she is. I once worked with a lady who was afraid to come in my office because of the pictures I had of my boy "Chevy" on my desk. . . Yep, you read that right -- she was afraid of pictures. Actually, if you already own a Rottie (or if one already owns you), then you probably have similar stories, as well as ones my dog hasn't thought of. . . YET! 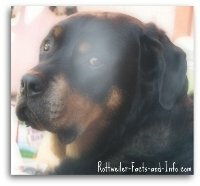 Rottie Stories - Do you have the smartest or funniest dog in the world? Of course you do! Tell us a story about your best friend. . . . Make us laugh, make us cry, or make us sit in awe - what are you waiting for? You can even include pictures to go with your story if you have them. Adoption Stories - Have you opened up your home and your heart to a Rottie in need? What kind of struggles have you dealt with, what kind of heart-warming story do you and your best friend have to share? Can you help other would-be Rottweiler angels with your words? Please share them here, and even upload pictures to go with. Rottie Pictures - Do you have the most beautiful dog in the whole wide world? Of course your dog is THE most beautiful, and I'm not one to argue! So, why aren't you showing off pictures? As I mentioned above, training is very important. Good foundation and obedience training are key, but you need to know (if you don't already) that you have to continually remind them of the rules. They are just like kids - if they think they can get away with it, they will try. But of course, they also become the axis that your world revolves around and part of your family. That is oh so true for my husband and me. We don't have any 2 legged children, so our world revolves around our dog. Without getting into too much detail here on this page, we fell madly in love with a Rottie named "Savannah" (no idea how I came up with that name) back in 1994. Okay, enough with the tears already! About 4 or so months later, we got suckered into rescuing a little (actually, not so little) boy with no name. His new daddy promptly named him Chevy, and you can read his crazy story on the Adoption page. I add information, stories and resources almost on a daily basis (as time allows), so make sure to browse around and check back often. I really hope to hear some of your Rottweiler stories -- I know you've got some that will have me in stitches, and probably make me cry too. Please don't hesitate to Contact Me if you have questions and can't find what you're looking for.